City Garden Tower. This brand new high rise project will be developed right in the heart of the city centre next to South Pattaya and Pattaya 3rd road. This prime project will boast an elegantly styled 30 floor skyscraper. 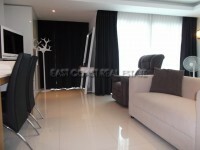 This 35 sqm is 1 bedroom, located on the 18th floor of the building. This unit is fitted kitchens, air conditioning and built -in furniture, Balcony with city and sea views. City Garden Tower facilities include a parking, sky garden with ocean view, communal swimming pool, sauna and fitness.